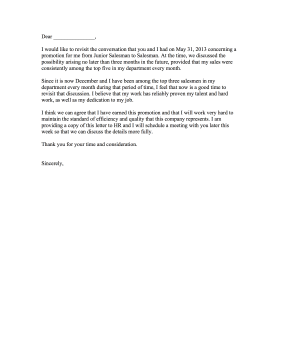 Employees who would like to argue for a promotion can send this employment complaint letter to a boss. I would like to revisit the conversation that you and I had on May 31, 2013 concerning a promotion for me from Junior Salesman to Salesman. At the time, we discussed the possibility arising no later than three months in the future, provided that my sales were consistently among the top five in my department every month. Since it is now December and I have been among the top three salesmen in my department every month during that period of time, I feel that now is a good time to revisit that discussion. I believe that my work has reliably proven my talent and hard work, as well as my dedication to my job. I think we can agree that I have earned this promotion and that I will work very hard to maintain the standard of efficiency and quality that this company represents. I am providing a copy of this letter to HR and I will schedule a meeting with you later this week so that we can discuss the details more fully.